I am so thankful for books from Master Books! I love the truth in them, I love the science behind them, and I love what they offer my family!! 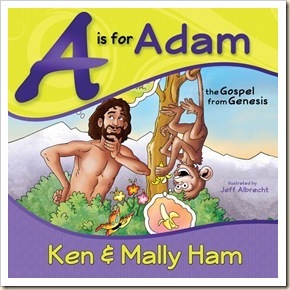 A is for Adam is a great addition to our library!! As a mom of four kids, all different ages, and not too spread out, this is the book I needed! I have thoroughly enjoyed reading this book with my youngest, who is desperate to join her brothers in baptism, but is not sure why. So I knew, after she has asked many times to get “bathetized” that is was time to go back to the drawing board. You see, in my home, my sweet 6 year old spends more time listening to our family talk about spiritual stuff that is simply too deep for her, and I have not been telling the basics to anyone for a while. So back to the drawing board…starting with A and Adam! This is a sturdy book, with an easel like set up so you can put it on a table and teach from it. There is the front color page with the story and great pictures, on the back (facing you) there is a page of things to teach and discuss with your children. This book would work great in a small group setting, but it works great on my couch too!! My daughter is loving the one-on-one time we have each morning while my boys have their quiet time. She loves to work through the book and answer all my questions. I especially love that this book introduces the myths of evolution at an early age!! It lays the groundwork to help these kids understand the truths of creation! I highly recommend this book to anyone with younger kids at home, a great teaching tool!! NOTE : I was offered A is for Adam, in exchange for an honest review, by Master Books. Next Getting away with some Sally! !